Jerry Crims of Tulsa, Oklahoma has been published in most all of the major dance magazines over the years. He was the first recipient of the U.S. Open Swing Championships Humanitarian Award in 1985. Jerry’s sense of humor was catching, and his dance background extremely impressive. 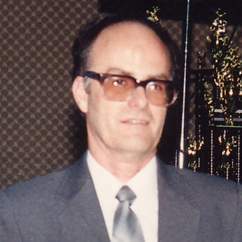 In addition to his reputation as an outstanding Showcase dancer, Jerry was a well-known teacher of Ballroom, Country Western, and Swing for over thirty-two years. He was a member of the National Swing Dance Council, president of Supreme Swing Dance Club, and editor of Danscene. He wrote the original Slotted Swing Dance Book with a section on how to form local and national Swing clubs. His first video featured slotted West Coast Swing. Jerry was faculty, advisor, and teacher for the National Dance Masters Conventions in 1985 and 1986. In Ballroom competitions he won The Best Swing Choreography at the Dallas Invitational in 1986, The Best Overall Routine at the September Fiesta 1986, and honors at the San Antonio Invitational in 1992. In Jack & Jill competitions, Jerry Crim won the Las Vegas Matinee with Sandy Trent in 1987, the National Swing Dance Convention with Sherry Lawson 1989, and the 1990 Overall with Michelle Mayer at the Anaheim U.S. Open. In 1990 Jerry was inducted into the National U.S. Swing Dance Council Hall of Fame. He taught for Supreme Swing in Tulsa, and Swing Dances Unlimited in Oklahoma City. He has a book available on Swing, and a library of video tapes, including his method for integrating the Dallas Push, Houston Whip, and West Coast Swing. One of the most popular tapes was his “Tandem” tape that features dance routines for two women and one man.